Weaving at Morris & Co.'s Merton Abbey Works. Detail from a picture included at the end of the Fine Art Society catalogue, whose details appear in the References below. The Great Exhibition of 1851 served as a catalyst for change. Although the Exhibition was a superb manifestation of Victorian optimism the aesthetic quality of many of the objects was abyssmal. However, the resulting profit funded the creation of the South Kensington Museum (later to be called the Victoria & Albert Museum) and the South Kensington Schools (now the Royal College of Art) whose purpose was to improve design both by precept and by assembling a collection of new and old examples of decorative arts. Two of the greatest pioneering designers were architects who were interested in all aspects of the decorative arts — A. W. N. Pugin and Owen Jones — both made significant contributions to the 1851 Exhibition and to design reform in Britain. Pugin valued textiles as an integral part of his decorative schemes and this helped elevate them to an art form worthy of note by top designers. All the key architects of the late nineteenth century spent some time designing textiles almost certainly because of his influence. Pugin's principles for the use of natural forms in the designing of flat pattern were key to the textiles of the Arts & Crafts Movement. Following the principles of Gothic architecture Pugin advocated the use of geometric interpretations of plant-forms arranged to fill a space rather thall the naturalistic bunches of flowers too often scattered over carpets of the 1840s His designs were often based on the ogee, the pomegranate and the pineapple [follow for an example]. Owen Jones believed good design came from the detailed study of ancient ornament which he illustrated in two highly influential design manuals — Plans, Schemes, and the Elevation of the Alhambra (l842) and more importantly The Grammar of Ornament (1856) The latter became an essential handbook for designers His work on colour was equally important and both aspects are ably demonstrated in Jones' designs for Benjamin Warner which won much acclaim at the International Exhibitions in Paris 1867 and Vienna 1873 . Jones was not alone in his fascination with Eastern cultures and the growing public interest and numerous exhibitions of artefacts from countries such as India and Japan led to a kind of mania. The interest in Japan in particular resulted in the Aesthetic Movement of the 1870s and 1880s. Some of the finest Japanese-inspired work was produced by the architect E W Godwin who collected and sometimes used Japanese artefacts in his designs and Bruce Talbert whose two publications on furniture and decoration were influential in Britain and America. Christopher Dresser, a successful industrial designer and a pupil of Owen Jones at the South Kensington Schools, had contributed a page of botanical designs to the Grammar of Ornament. As early as the 1860s Dresser had established a large design studio employing many students and freelance designers. He travelled to Japan in 1878 at the invitation of the Japanese government to advise on their art industries and published a book on his findings. He was profoundly affected by the Japanese culture art and architecture, and his designs reflect this. He advocated the use of functional shapes and relevant geometric ornament using only materials suitable for the purpose intended. Although he is best remembered for his geometric utilitarian metalwork designs, it is probable that most of his studlo's output during the 1870s and 1880s was for wallpaper and textile design. William Morris, a contemporary of Dresser, is the most famous of the Arts & Crafts pioneers and probably the most influential figurc involved in nineteenth century textile production. His Iegacy lies not only in his approach to design but also in his methods of manufacture as well as his views on the role of the designer and craftsman. Key elements in Morris's textile designs were the "net" based on a trellis design and the "branch" based on a diagonal line. Many were inspired by historic textiles at the South Kensington Museum where he acted as advisor. His love of nature was another strong influence and he favoured the type of flowers found in Elizabethan gardens and reflected in 16th-century embroideries. Morris's dislike of commercial production and chemical dyes led him to traditional earlier techniques such as handloom Jacquard weaving and the use of vegetable dyed hand-block printing. Morris's woven textiles demonstrate an understanding of design and texture, his ear]iest examples being considered amongst his best work (cats. 2, 18, 21). Texture was achieved through a variety of weaves, which ranged from double and triple woven cloths, silk and linen mixtures, wool and mohair damasks, brocatelles and silk tissues. Several other specialist weaving and dyeing firms followed the same principles during this period. Thomas Wardle worked closely with Morris in experimenting with vegetable dyes. His travels to India also influenced his work, both in terms of design (cat. 28) and the type of silk he used. He printed Leon Victor Solon's only known textile design, which is considered one of the most beautiful figurative patterns from the Arts & Crafts period. 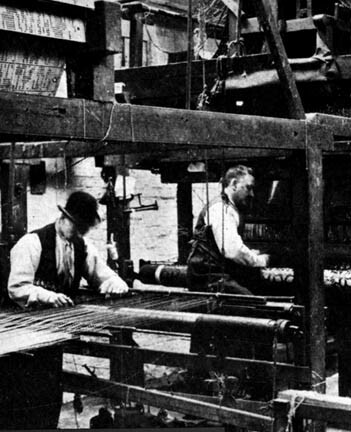 Alexander Morton was another well known manufacturer of woven fabrics who developed high quality weaving techniques and commissioned work from leading designers. In 1891 The Art Journal reported that Alex. Morton & Co., were producing "beautiful textiles for a wider public than Morris cared to consider . . . " They sold through all the largest retail outlets in Britain and were noted for giving a share of the profits and successes of the company to the workers. During the last years of the 19th century a new style gradually emerged based on knowledge of historic design but without direct reference to it. This new style was lighter and more stylised. Upholstery was simplified and curtains became shorter and less fussy, often made of fine printed silks and cottons. Outstanding draughtsmanship was an important charactcristic of this stylc whose finest proponents were Lindsay P. Butterfield, George C Haité and C. F. A. Voysey. Voysey, who liked to refer to himself as a Goth, was the central figure in English architecture and design during the two decades around 1900, and his work and great originality of style uere a source of inspiration for Art Nouveau designers cn the continent. Pevsner, in Pioneers of Modern Design describes Van de Velde's reaction on first seeing Voysey's designs: "It was as if Spring had come all of a sudden." His woven wools and silks show highly original colour combinations with emphasis on tonal harmony. British Arts & Crafts textiles were enthusiastically received in America where they inspired a renewed feeling for design. Foreign manufacturers were keen to purchase British goods. These were ordered by fashionable shops in America, Australia and Europe, especially France, Germany and Scandinavia. Liberty's, who had always had an interest in 'Art Fabrics' turned to Art Nouveau in the 1890s , selling the work of Silver Studio designers such as Harry Napper and John Illingworth Kay. In 1890 they opened a shop in Paris which became popular throughout fashionable Europe, numbering continental museums among their customers. Such was their success that the Art Nouveau style became known in Italy as "Stile Liberty."